Applications for 2012-2013 Resident Assistants are now live online! Resident Assistants live in our on-campus housing and assist with creating a positive residential environment. RAs aid students in solving problems of virtually every kind. They also help in planning programs for the building. RAs are charged with the responsibility of creating and maintaining an environment conducive to personal, academic and social growth. Duties also include many administrative functions. RAs, as University officials, are responsible for the enforcement of community standards. The primary contact between the Office of Housing and Residence Life and the residents is the RA. RAs participate in an on-call rotation as first responders for emergency situations, lockouts, and policy enforcement. The Resident Assistant reports to the Resident Director/Residence Life Coordinator. 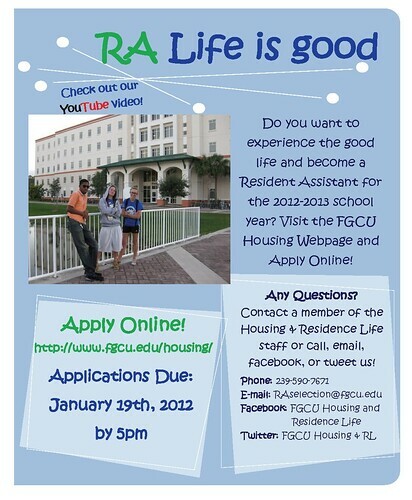 Watch the YouTube music video to learn how RA Life is Good! As we move along in the application process, we will be continuing to share information on our website, social media and through informational sessions on campus. If you have any questions about being an RA, the benefits of being an RA, or the application process, feel free to contact us! You can email us at RAselection@fgcu.edu or call us at 239-590-7671. You can also ask questions here, on our Facebook page or via Twitter. Ready to apply? Read the application instructions and apply here! Applications are due by 5pm on January 19, 2012. It’s Halloween week and there’s a lot to do at FGCU to get in the spooky spirit! We’ve got you covered with a guide to all things that go bump in the night so you can make the most of Halloween this year. Join us for exciting events across all of North Lake Village. Carve and smash pumpkins by the Tiki Hut, then head over to the Chiki Hut by the waterfront for the ultimate zombie station. There will be a bonfire and a big game of Humans v. Zombies. Don’t know what that is? Stop by to find out! We’ll give you a clue – it’s a little like playing tag. You can also satisfy the trick-or-treater in you by visiting the candy buffet and Ice Scream! Sundae station in the courtyard between Egret and Pelican. While you’re there, snap some photos of your costume in the photo booth and upload them to our Facebook page to be featured! Make sure to be in front of the Chiki Hust at 9pm for the big dance and costume contest! West Lake Village residents are encourage to get in the Halloween spirit by joining us for a party in the community center. You can enjoy pizza while watching classic scary movies. Make sure to come in your best costumes, because there will be a costume contest with fantastic prizes! Join RHA and the Office of Community Outreach and give back to the Fort Myers community by volunteering for the annual Harvest Party on the South Village Green Space. There will be carnival games, bounce houses, music and trick-or-treating for the children of Fort Myers. Visit the RHA website to sign up to hand out candy for trick-or-treating if you’re a resident of Palmetto Hall, or sign up to help on the Green Space for all other residents. You can earn service-learning hours and have a blast doing it! This year the annual Halloween Spooktacular will be taking the party to the roof! Join us on the roof of the SoVi parking garage for an out of this world party. The theme is extraterrestrial and all in attendance will have the opportunity to meet Morgan Beall, a UFO investigator from MUFON. There will be food and drinks, a DJ, games, prizes, a costume contest, an alien dissection table, and more. For more information on the events, visit our Facebook page to view the events. Happy Halloween! Can you believe move-in was almost a week ago now? As you settle into your room and adjust to your new class schedule, there are some things you should know about living with us here at FGCU. Your RA (Resident Assistant) is there to help you. If you have a question or concern, don’t hesitate to ask them! Our RAs love to help and want to get to know you, so make sure to introduce yourself. Everyday from 10pm-8am there are RAs on-call at each front desk available to help you as well. If you have something in your room or apartment that needs to be fixed, please don’t attempt to do it yourself! We have a full maintenance staff that will complete the work for you. You can also request replacement light bulbs or smoke detector batteries through maintenance. You can fill out a maintenance request form online at your convenience at http://gulfline.fgcu.edu through your Housing Portal. If you have an emergency request, such as a broken water pipe, call the reception desk or contact the on-call RAs immediately. We provide trash services and recycling centers for all our residents. Residents in WLV may use the valet trash service by placing all trash in bags outside your apartment door between 7am and 9:45am on weekdays. Trash compactors are available for any other hours. Residents in NLV must take trash to the compactors. You can watch our fun tutorial on using the trash compactors on our YouTube channel. Residents in SoVi are responsible for depositing trash in the trash chute located in each building. Recycling centers are located in each housing area – NLV, WLV and SoVi. Make sure to read all the instructions for recycling before putting anything in the bins. The recycling bins are not for any trash. Each resident has a mailbox where all mail will be delivered. Residents in SoVi will have a box on the first floor of their building, residents in NLV can check their mail on the first floor of the Commons and residents in WLV can find their box in the Community Center. If you receive a package, you’ll get a notification slop in your mailbox and you can pick up your package within 21 days. No USPS mail will be delivered on weekends, holidays or dates FGCU is closed, but private deliveries from vendors will still be received. You can send stamped mail through the reception desk in your housing area. If you have any questions about living on campus, feel free to ask your RA, leave a comment here or check out the Community Guide on our website.